After taking a week off, we’re back! Here I was, ready to write about this episode last week and then the episode never came. I’m not sure what kept it off the air for a week, but we were offered an explanation in the form of a tweet from the TMW official Twitter. Apparently, the devious GWM had something to do with delaying the episode. The only reason that I’ve stopped shaking my fist at them is to write this. 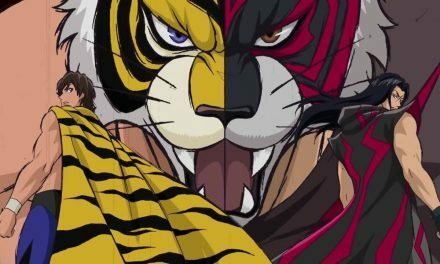 As always you can watch every episode of Tiger Mask W over at Crunchyroll and if you want to find the rest of my recaps, you can do that here. In the opening moments of today’s episode, we get to see one of the realities of being a freelance wrestler. You’ve got to pack as much merch into your car as you can before you head off to the venue. Naoto questions if he and Haruna are bringing too much, but Haruna assures him that they’ll sell all of it, especially if Tiger Mask is there at the merch table with her. It’s time to sling them gimmicks, Naoto! As Naoto and Haruna head to the venue, we actually get a fair amount of backstory for Naoto spread out over the drive. They make a pit stop at the hospital so that Naoto can visit Daisuke Fujii, Naoto’s former mentor that was rendered unable to walk after his brutal match against Yellow Devil. During their visit, Fujii tells Naoto to stop wrestling for his sake and to wrestle for himself. Naoto says that if a match comes along, he’ll take it. While revenge against Yellow Devil is a priority, he’s not making it his singular goal. In fact, an IWGP championship is in his view right now. Fujii’s nurse interrupts their conversation, saying that Fujii needs to have some sort of physio. The nurse updates Naoto on Fujii’s current condition. She’s been getting into watching wrestling herself after watching it so many times with Fujii. She just so happens to be a big fan of Tiger Mask, giving Naoto an opening that even he isn’t so dense as to not capitalize on. The nurse asks Naoto if he’s ever been to a wrestling show before and then laments the fact that she hasn’t had the opportunity to go. Then to Naoto’s surprise, she asks if he’ll take her to a show sometime. Naoto agrees and my favorite sitcom trope is set up. Instead of Naoto taking two girls on dates to the same restaurant, Naoto is going to have to go on a date while wrestling as Tiger Mask on the same show. I’m already declaring this future episode to be the best one of the entire series. I can’t properly express how excited I am for this to happen. Naoto gets back to the van with a smirk on his face and plays dumb when Haruna asks him what happened. There’s no way this will blow up in Naoto’s face. Nope, not a chance. The road trip continues and the travelers end up taking a detour after the road they needed to take was closed. This leads them past an area that Naoto is very familiar with. Haruna points out a bunch of temporary housing units and Naoto explains that he used to live there. Naoto’s hometown was struck by a natural disaster, something that I would presume to be the huge 2011 earthquake that Japan is still recovering from. He lost everything in that event, including his family. This is a huge revelation. Naoto being an orphan really helps explain why he has used the defeat of his mentor as such a driving force in his life. Just like every superhero worth their salt, Naoto has a tragic origin to go along with his abilities. A flashback shows that Naoto was at a show with Fujii in the main event. Fujii put up a fight so inspiring that Naoto ran backstage and begged Fujii to train him to be a wrestler. This match was the first thing to really move Naoto since his parents passed and his life was turned upside down. Fujii accepts him and essentially becomes Naoto’s surrogate father. In the flashback, Naoto’s wearing an off-white cardigan and I think that it looks very nice on him. It would seem that he was a very proper boy before becoming the hunk that always has training on his mind that we know today. It’s a good thing we saw that flashback because the venue for today’s show is the same one that Naoto saw Fujii wrestle in. WHAT!? What a coincidence! (Not really, I’m being sarcastic. I know sarcasm can be missed over text so please don’t subtweet me thanks) Today is a big moment for Naoto. He began his journey in this venue and now he’ll step into a New Japan ring as Tiger Mask. The people of his hometown might not know that this is a homecoming for Naoto, but they’re ready to buy his stuff at the merch table. As Haruna slings merch for Tiger Mask, Ryu Wakamatsu steals her technique to sell shirts for Okada. When she call him on it, Ryu denies his tactic and then asks Haruna out once again. It appears that he’s worn her down enough and she accepts his invitation. With both Haruna and Naoto getting dates in this episode, I’m positive that we’ll see some related hijinks in the future. Match time comes along and this week we get to see Tiger Mask team up with Tanahashi to take on Tama Tonga and Bad Luck Fale. With all the New Japan branding all over the show, I find it a bit surprising that the Bullet Club logo is completely left off of Tonga and Fale’s gear. The Bullet Club team tries to jump Tiger and Tanahashi before the bell, but they’re met with twin dropkicks that knock them both from the ring. The bell rings as Tonga and Fale try to recover on the outside. Tonga gets to his feet and Tiger Mask dives through the ropes to spear him with a brutal looking tope. Tanahashi gets in on the high flying too, hitting Fale with a High Fly Flow from the top rope to the floor. We don’t get to see any offense from the Bullet Club boys in this episode. Tiger Mask plants Tonga with a German suplex to get the three count while Tanahashi holds Fale at bay with a Full Nelson. On commentary, Yuji Nagata notes how good of a team TM and Tanahashi are and then says they should go after the tag belts. Tiger Mask takes a moment in the ring to soak in the cheers of his hometown fans. He bows to each side of the arena before heading to the back with Tanahashi. When they get to the gorilla position, Nagata offers the new team an IWGP Tag Team Championship shot at the next big New Japan show. You can’t say that the booking on this show isn’t like what we see in real life New Japan, that’s for sure. On the ride home, Naoto starts to wonder if he’s doing the right thing. He went through hellish training in order to beat Yellow Devil, but now he’s just working as an upper mid-carder for New Japan. He worries if he’s leading a career that is too ordinary, worries that actively go against what he told his mentor earlier in the day. Haruna talks some sense to Naoto, telling him that he wanted to become a wrestler before the whole Yellow Devil incident and that he shouldn’t let that consume his career. Naoto thinks back to his first days as a wrestler with Takuma. This flashback shows us Naoto’s first hard days of training and how Takuma pushed him to stick with it and surpass their superiors. Naoto tells Haruna that Takuma went missing after his father was crippled in the ring. Little does Naoto know that Takuma isn’t missing at all and is really Tiger the Dark. Meanwhile, at the Tiger’s Den, Takuma practices a new submission hold on Odin, a Tiger’s Den wrestler that we saw lose to Tiger Mask in the first episode of the series. It seems as though Odin is being punished for his loss with something called a “Tiger’s execution.” Odin acts as the test dummy for the wrestler’s new offense now. Ms. X interrupts practice to tell Takuma and two other wrestlers (Takuma’s friends. Michael and Kevin? Johnny maybe? I don’t remember their generic white boy names) that they’ll be heading to Japan to compete in a tournament. Odin begs Ms. X for his punishment to end and she says that “it will end if you join the next Hell in the Hole.” I don’t know what that is, but Odin seems really bummed out about it. He screams that he can still wrestle on the main stage, which prompts a look of disgust from Ms. X. She calls for her assistant, known only as Lady, to give her a whip, which is then used to discipline the wrestler. The only other time I can think of there being another character named Lady is the woman that dated the Janitor in Scrubs. I guess it’s an oddly distinct name. On the GWM jet to Japan, Takuma asks what Hell in the Hole is and Ms. X tells him that he doesn’t need to know. I’m just going to assume that it’s some sort of Cage of Death style match that takes place in a hole. Ms. X says that Yellow Devil will be participating in the tournament as well. Takuma tries to hold in his excitement at the chance to get revenge for his father. He can’t let it be known that he joined GWM to take out one of their own wrestlers. Back with our hero, Naoto turns on the TV to watch GWM News. They show off the newly built arena just for GWM, the Max Dome. All of its crazy colors make it look like someone threw up on the Tokyo Dome. Naoto isn’t the only one watching. Over at the New Japan offices, Okada, Tanahashi, Ryu, and Nagata are all glued to the TV. 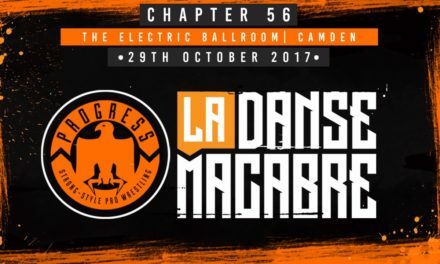 Tanahashi says that he wants to wrestle in the new venue while they talk about how large it is. The newscaster announces that the Max Dome will hold the first Wrestle Max Masked World Tournament. We don’t see it, but I’m sure that somewhere Great Sasuke is throwing his TV across the room. The first announced participants are the GWM Euro Champion, Wagner, Tiger the Dark, and Yellow Devil. Ms. X then welcomes all masked Japanese wrestlers to participate in the tournament as well, with a grand prize of $100,000. When Yellow Devil was announced, Naoto knew that he would have to find a way into this tournament, but he first night of the tournament goes head to head with New Japan’s next show, the very same show that Tiger Mask has a shot at the tag titles on. Naoto tells Haruna to get him into the tournament anyways. Forget his tag title match, he has prey to hunt. Naoto is doing exactly what he told his mentor that he wouldn’t do. Naoto takes his bike to the New Japan offices where Nagata has declared that NJPW won’t send any wrestlers to the tournament. Nagata wants everyone told this, especially Liger. I find it a little funny that the cartoon Liger would have his loyalty questioned like this. Tanahashi asks about Captain New Japan and Nagata says that he wouldn’t even go if they told him to, which got a huge laugh from me. I wonder if we’ll ever get to see Bone Soldier in this show… I’m getting off track. Tiger Mask arrives at the office and bows before Nagata, begging his forgiveness. He tells them that he’s joining the tournament. Tanahashi angrily asks him why he would leave their team. Naoto says “In the NJPW ring, I learned the joy and depth of pro wrestling. I’m very grateful, but I’ve decided to seek a new battlefield.” Tanahashi understands what Tiger Mask is doing and lets him go. TM bows one more time and then leaves. There’s something kind of funny about Tiger Mask leaving New Japan to go do whatever he wants as a freelance wrestler. 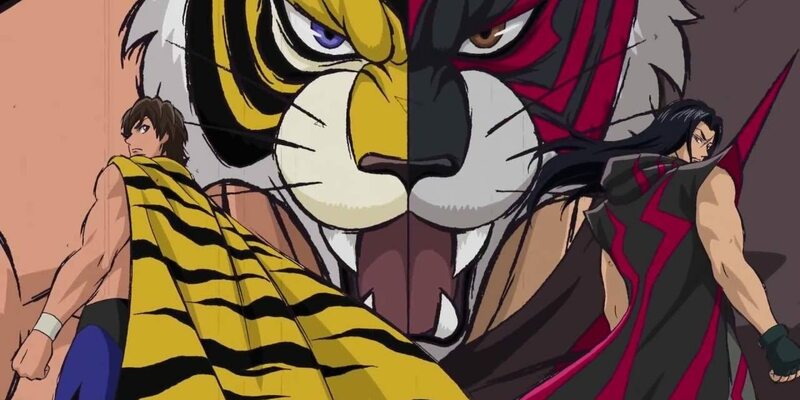 A few weeks ago we saw Tiger Mask brought to life in a New Japan ring by Kota Ibushi, a man who also left New Japan to go do whatever he wants as a freelance wrestler. The parallels continue when you think that Tiger Mask is participating in a tournament run by an American company trying to take control of America, while Ibushi left Japan for some time to go wrestle in an American tournament for WWE. I doubt that Ibushi was chosen for the Tiger Mask role because of his similarities to the cartoon character, but it’s really hard not to make the comparisons. Next week: the Masked World Tournament begins!!! Tiger Mask has jumped ship, but I hope you’ll all still join me here a week from now! STR 185: WWE TLC, NXT, Sasha, Ellsworth & more!